I would like to report an incident happened today on the Lornie road towards Bukit timah the above said blue honda vezel private hire car is traveling and road hogging on the 1st lane road hogging refusing to give way to the ambulance on siren . he road hogging for some time i realise he was driving even slower than the 2nd lane lorry and there is no obstruction or cars in front of him as seen on the video clip provided . 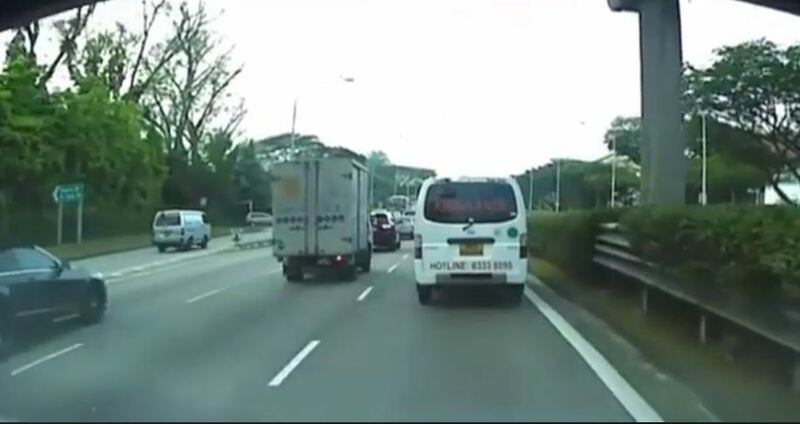 she causing obstruction to the amublance on emergency ,later he cut to the middle lane and then cut back in front again of the ambulance as seen in the video provided . this driver is a serious dangerous driver without any road manners or courtesy . and poses a serious threat to other users on the roads. please look into the video using a driving DV recorder provided at the time and take the appropriate action against this dangerous and inconsiderate driver.I am also willing to testify in the courts of law against this driver. Previous ArticleNETIZEN IS PISSED OFF TO HAVE AN ENCOUNTER OF RACISM IN SINGAPORE! Next Article TURN OFF BY INCONSIDERATE PEOPLE WHO PUT THEIR LEGS ON EMPTY SEAT? DON’T BE ONE OF THEM!